Parents of current students can keep in touch with school events using ClassDojo. Fáilte go suiomh idirlion Scoil Oilibhéir Naofa, Baile an Bhiataigh. Welcome to our website. 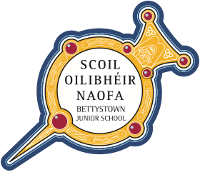 We are a junior primary school in Bettystown/Laytown. We hope to give you a glimpse of the busy and exciting land of learning at our national school. In Senior Infants, our topic for September is ‘All about Me’. The children have been learning in Irish how to introduce themselves, ‘Is mise…’. Look at our beautiful garden! It is bursting with delicious fruit and vegetables almost ready to be harvested!